I can finally say that together we made this happen! 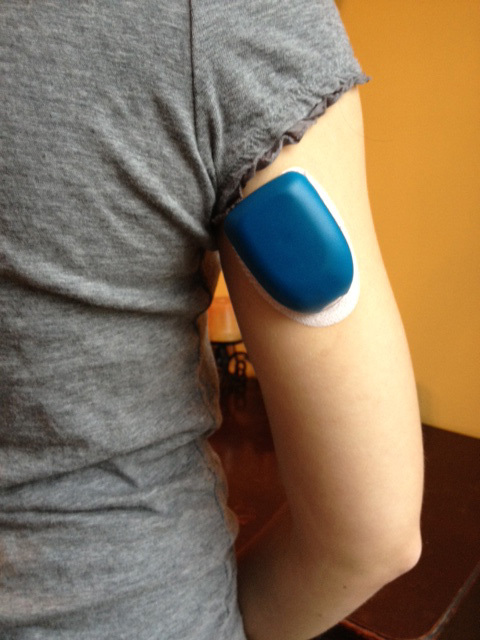 We haven’t forgotten about the hardshell cases, but we were able to develop Pump Peelz to help decorate the OmniPod. Go to www.pumppeelz.com to learn more! Also, if you want to help support finding a cure for diabetes, visit www.jdrf.org. On a side note, if you go to Moe’s Southwest Grill and “make it a meal” they donate a portion of the sale to the JDRF. Great cause and great food. OmniSkinz is a plastic case designed to fit over the OmniPod. 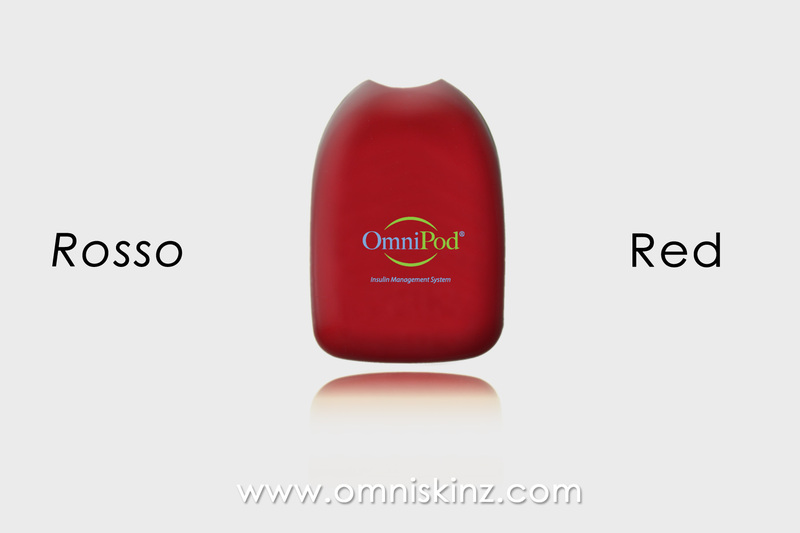 I developed OmniSkinz to help type 1 diabetics using the OmniPod express themselves by customizing their pods. A 12 year old boy could have a basketball themed pod for his games, a 16 year old girl could have her pod match her bathing suit at the beach, a 30 year old mom could have a “skin colored” case to help hide her pump. The possibilities are endless. I never really considered being a product developer, innovator, or inventor. After all I went to school for music technology! But two years ago when my fiancée, Emily, was diagnosed with type 1 diabetes, everything changed. Our lives became consumed with glucose test strips, lancets, ketone strips, Apidra bottles, and sharps containers (most of which she can hide in a purse the size of my iPhone). I had a lot of learning to do! For those of you who are unfamiliar with type 1 diabetes, let me fill you in! If you already know all about this stuff scroll down to the OmniSkinz Story in bold. Type 1 diabetes… the “Reader’s Digest” version. First off, it’s not the same as your grandma’s diabetes… that is called type 2. This form of diabetes is called type 1 (aka juvenile diabetes). It’s an autoimmune disease and not a lifestyle disease. You can be a young Olympic athlete, a toddler, a teen etc. and still be diagnosed. Essentially, type 1 diabetes is a pain and an inconsiderate jerk. The other main point that differentiates type 1 diabetes is that it is “insulin dependent.” What this means is that your body attacks the beta cells in your pancreas and renders it relatively useless. The only way to manage this form of diabetes is with insulin therapy via injections or insulin pumps. 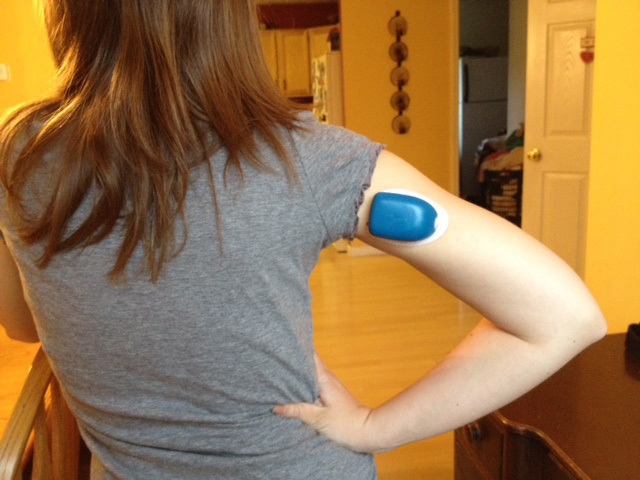 A few months after Emily was diagnosed she decided to go with the OmniPod Insulin Management System. It’s a revolutionary little pump that uses no tubing and sort of looks like a white travel sized computer mouse. You can stick it to just about any part of your body and it doses the proper amount of insulin. The little pump really makes it much easier to live a normal life. I highly recommend checking out the product on their website if you are considering getting an insulin pump. Not too long after Emily went on the OmniPod, I started to think about the possibility of making a case for the pump. We live in a world of products that are personalized. Cell phones have millions of different cases and colors to choose from… diabetics on the OmniPod have one color – white. I obviously wasn’t the first person to think that the OmniPod was bland. A quick google image search will show hundreds of teens and kids putting stickers on their pump. I even saw one image of a Christmas Tree decorated with OmniPod ornaments. After some brainstorming, I created a rough sketch to show the dimensions and features of the OmniSkinz case (see above). I also tried to design a very rough sample of what I envisioned being designed on the cases. I don’t think anyone is giving me an award for my floral pattern. Once I had the design I started researching how to get a plastic prototype made. After a few phone calls and emails I found that my school, California University of Pennsylvania, has an industrial tech program along with a plastic prototyping machine. Bingo! I talked with a professor and was able to propose my idea to one of the classes. One student in particular thought the idea was worth pursuing. The original prototype was created for less than a hundred bucks and a few hours of work. Alright, so the first prototype really wasn’t the greatest. It was a bit bulky and still had that medical white look to it. On the bright side, it was definitely a start. Fast forward a few months and I receive a phone call from the same student. “I’ve got it” he said, “let’s try colored plastic vacuum forming instead.” Problem solved. It was cheaper, quicker, and looked way better. 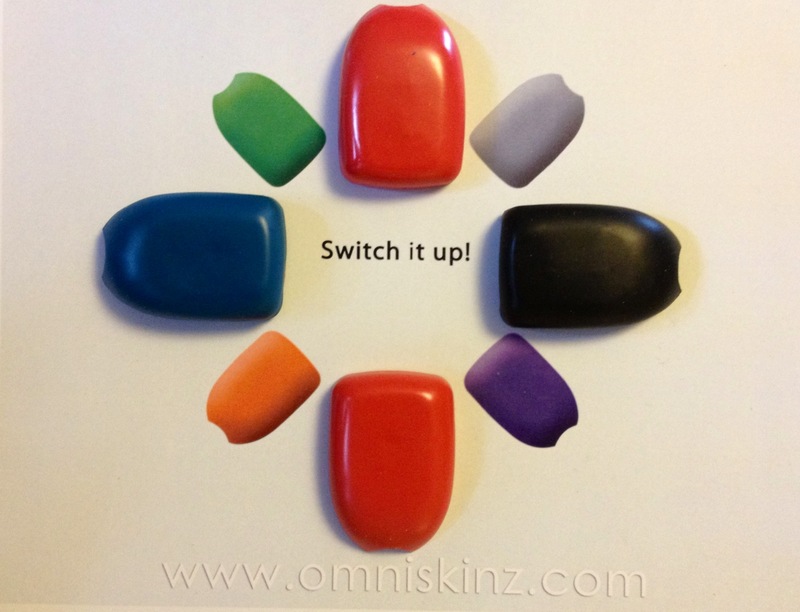 The final OmniSkinz prototypes were born in less than ten minutes. Fun. Funky. Fresh. That was the look that I was going for when I developed the look of the first advertisement for the brand. The “Pimp Your Pod” slogan was born. I designed this the same week that Steve Jobs passed away. I have always been inspired by Apple and decided to make the pods look like icons on the “dock” of a Mac. I should also point out that I’m not a designer or a Photoshop expert. I found everything that I needed to know about the Adobe Creative Suite on YouTube or www.lynda.com. The design above was inspired by the old colored Apple iMac advertising campaigns. I called this one “Jazz it up.” Emily later came up with the “Switch it Up” concept which I used for the final foam board presentation. The “Rosa Pod” above was inspired by the Fiat company. I test drove a new Fiat 500 in Washington D.C. and loved the marketing material I was given after the drive. The one pamphlet I was given had each of the colors that the car came in… listed in Italian! Rossa, giallo, nero, grigio etc. I loved the idea. It sounded artsy and sophisticated. And finally, the actual prototypes ready to be sent to Insulet Corp with the “Switch it Up” slogan created by Emily. Two weeks later I had a really nice phone conversation with the director of marketing. He loved the idea and explained that the company may consider the concept in the future. My final thought with the OmniSkinz product is to have OmniPod users take the survey so that I can collect the data to show the Insulet Corp that OmniSkinz is a marketable product. With your help I can show that a small idea can have a big impact. Take the OmniSkinz Survey Here! Email the Insulet Corporation about OmniSkinz Here! ← Re: “Just Ask.” Advice copied from my inbox. My 9yo daughter was diagnosed with T1D 18 months ago, and started the OmniPod insulin pump last August. I showed her your design and prototype and she literally jumped up and down and clapped her hands with excitement. I shared your link on Facebook and emailed Insulet requesting they take a second look. Truly a great design and a product we would love to see available. Thank you for your time, talent and dedication to developing this fantastic idea. That is so sweet:-) Thank you so much for your support! We will do our best to get this to the market! Since Omnipod doesn’t want to sell your product, why go thru them? Why not market them thru amazon or ebay as an independent sales point. not sure if this is economically feasible, but might be worth a try. You could also do skinz for the PDM or other pumps….as well as general glucose meters. I would love to market it myself along with other products. I have a few connections I’m going to use to try to get manufacturing going. I’ll keep you posted! I love it!!! I have been telling everyone that I know we need to either come up with a silicon skin, or sticker type skin or something to help ‘dress up’ the omnipod! That’s awesome Angela! It’s a great idea and I hope to help everyone “dress up” the pod. That’s awesome! I’m sure it’s a lot more fun to wear the OmniPod when you can customize them! My twelve year old son who wears the Omnipod really likes this idea..Thanks..Looking forward to having this available in the near future 🙂 Best wishes! Linked over from three thirty three. LOVE this idea! My 8yo has been pumping for 17months and we all love the system. She, like most girls, would FLIP over the chance to have a pink, excuse me, rossa 😉 pod! Thank you so much for the support Denise! I’m sure she would love the “rossa” pod! Thanks for taking the time to email and take the survey. Hopefully soon I can tell her YES! That is so sweet. I will do my best to make sure we get this available for her! Email me at omniskinz@gmail.com with your daughter’s name and I’ll photoshop her a pink one! Okay…now she’s telling me she wants one in every colour! Hi Scott. This is Caleb. The idea is cool. I think that it will sell well. I was really excited when I saw the pictures of the green Caleb skinz and the Yankees skinz. Thank you for making those for me. I like your prototype picture. I think diabetes is an inconsiderate jerk too. I love this idea and agree with someone above that you should market them yourself —- the power of the DOC is strong and the interest is already high! I would love to help in any way that I can. My son, Nate has been podding for 2 years — he started when he was 20-months old. We make the OrnaPods with our old pods. I’ve spoken with the folks at Insulet too and I know that they don’t have interest in things because of the liability of it all. It doesn’t mean they probably don’t love your idea!! Everyone else does. I think you’re right. It’s probably best that I start making these on my own. I just need to start talking to potential investors and manufacturers. If you have any advice or know anyone that can help let me know! I love the OrnaPod concept! That is such a neat and crafty idea! Thanks again for the support! I appreciate all the wonderful feedback! Don’t forget to keep in mind the pods are going to reduce in size this summer! I love love this idea and would totally order them for my daughter Ellie! Keep us posted! We also love the idea of decorating pods to make them cool for kids. Our son has been on the OmniPod for almost four years now and we decorate them with sharpie markers or temporary tattoos. 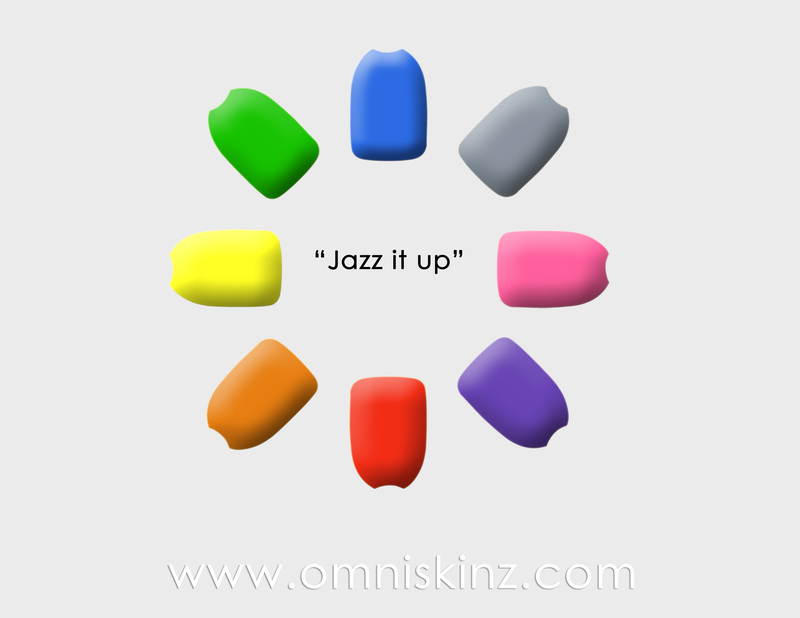 I agree with others that you should try marketing them on your own but keep in mind that the new, smaller pods, will be out soon, which may impress a need for you to make some adjustments to the skinz. We too wish you much luck in your venture and hope to see these available sometime soon. 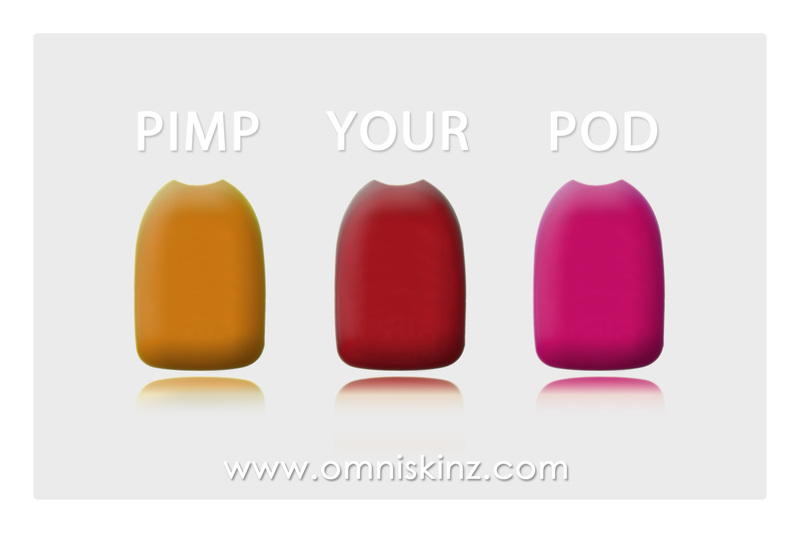 My intent is to release the OmniSkinz concept with the release of the new and smaller pods. I just simply don’t have the dimensions yet for them! Thank you so much for the well wishes! I’ll do my best to get these for sale as soon as I can. That is really cool that you guys decorate your pods with sharpies and tattoos! Anything to make diabetes more fun is worth doing! Good luck and I hope you have success soon! Hi Emily! Send me an email at omniskinz@gmail.com and I’ll photoshop an “L” on one for your daughter! Thank you so much for the support! My daughter is not currently on a pump but I know that eventually she probably will want to (she is only 3.5 right now and just diagnosed 3 weeks ago). But knowing her and her love for customizing things to her liking I know this would be a huge hit!!! I will definitely look into selling these myself! I just need to find a good manufacturer to work with. I love the Dragon’s Den and Shark Tank! You never know, it might be an option. Thank you so much for the advice. I will look into it! In the meantime I think you’re right, I just need to find a good manufacturer. Thanks so much for the support! I’ll keep you posted. I am making the switch from Minimed to the Omnipod this week and found your website this morning while researching some more. One thing that I have always enjoyed about the minimed pumps is that there are so many customizable options. I can choose the color of pump I want (from a very select few choices), the color of my infusion sets (again with only blue and pink as options, but still have choices), and millions of different options for skins! I have already ordered a green silicon case for the pump but the pods seem so bland. I applaud you for all your hard work, and will be one of the first in line to buy some of these as soon as they become available! I have had a hard time with control most of my life (diagnosed at age 8, 15 years ago), and have found that when I make my supplies my own, that I have more motivation to use them! I am looking forward to these becoming a viable option in the near future both for added personal support as well as a “coolness” factor! Hi, I love your concept. My only question is how much weight it would add to the pod and if the weight would affect the pod adhesion. Good luck with your progress! Great idea! These are fantastic. My daughter chose not too get the omnipod and got the animas pump instead because it is pink 😛 I think insulet is making a huge mistake by not backing your awesome designs! My 10 yr old daughter would love this!! I sent you my thoughts during the survey. I really hope you can make this work soon. Although then they will change the pod sizes on you! Now that you know how to do it, making the adjustment for size should be easier. I am going to promote you everywhere. Good Luck!! Hi Denise! Thank you so much for the support! I certainly appreciate your comments and thoughts in my survey. I take them all very seriously! I’ll do my best to get this out there for your daughter! Will you try to make smaller covers if the smaller pod ever gets here? My daughter is 2&1/2, we are not pumping yet because we are waiting for the smaller pod. I would def. buy your covers. Of course! We will make them smaller as soon as the new pods are on the market! As a 19 year old living with type 1 diabetes, i think this is a great idea! especially for younger kids. I was diagnosed two years ago and have been on Omnipod for about a year, and I think this would be something i would invest in. Even as a kid in college haha. I think this is a great thing you have done, especially for your fiancee. I hope you see some sort of success with this, I know I will be rooting for you! I Love the skinz. I can’t wait to get a few of them in different colors it will be great to be able to cover the not so attractive yucky white. The Red one is amazing. Thank You, Thank You, Thank You for your due diligence in making a finished product that’s so appealing. And if so what the shipping costs. These are perfect 🙂 I want a pod cover in every color!!! I wear them everyday and they are a part of me! As a type one diabetic for the past 14 years, I would love to accessorize and have some fun with my Pod!! I just found your site here and have been patiently waiting for you to come back on the 19th from your wedding but here it is the 21st and you are still not open! My daughter, almost 12, was diagnosed last year at age 10 and is going through her most embarrassing tween years. She wears an omnipod and I think this is just what she needs to help her not feel so self conscience about wearing her pump! Congrats on your recent marriage! But I need you! I don’t know how else to contact you since I can’t get to your pump peelz site and I do not have Facebook so I can’t contact you there. Can you please tell me when your store will be back open? I don’t even know what your prices are so until you open again, I know nothing! Hi Crystal! You know how to find me don’t you? 🙂 I just sat down to go through inventory – give me 30 minutes and I’ll have it up for you. Also you can always contact me at scott@pumppeelz.com! Thanks for the kind words – if it helps your daughter we can always make her some custom ones to make her feel better. We could even have her design one that she can wear… send me an email and we’ll chat! Ever have a million-dollar idea only to Google it seconds later and find it out there? ; ) I think this looks great. I am an Omnipod pumper and was having a conversation with a friend with a 10-year-old daughter who is starting on the pod, but she doesn’t want people to see it. This would be perfect for her. Keep it up – you are on to something! My four year old daughter would LOVE this! She loves to show off her pod. Right now we decorate with stickers and temporary tattoos.